Yes, thank you. And I had a child, so, yes (everything is real)! I have no idea. I don't think that far in advance. I don't know. I don't even know where I'll be. What about you? Is that an invitation? 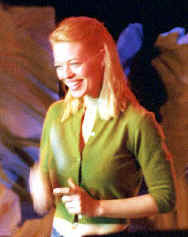 Jeri Ryan loves to eat food. Anything. I love food. That's the difference between me and Seven. I got that from my Dad. Cheesecake is my favorite. Barbecue-ribs, Haagen-Dazs ice-cream, spaghetti, I could go on and on... I love food. But cheesecake is my favorite. I wish that were true but I haven't heard anything about that. We did "Dark Skies" a couple of years ago. And I love doing that show. I know it was very popular in Germany, wasn't it? Nobody in America wanted it unfortunately. There were only about twelve people in America who saw it. And for a while there were rumors of getting David Walsh and others to do a movie or a series on TV but it never happened. Then I got on Star Trek. So there was no way of getting back together again and it's been so long ago now that they've dropped the idea. But "Dark Skies" was a great experience and I loved the character that I played in it. I was hired to attract a certain demographic but it wasn't only that. I only know what Rick Berman and (Brandon Robbins?) told me. They knew they wanted to add a Borg, I think it was Brandon Robbins I guess, and originally it was going to be a man. And whether it was going to be Brandon or Rick, but one of them decided "Okay, but why don't make it a chick? And while we're at it, why not make it a babe? And while they were auditioning I don't think it was that specific thing they were looking for. But the way they explained it to me was that after I had walked into the room they knew I was what they were looking for. Including the physical package. This is not my term, that is the way they put it: a physical package with a nice plot. It was a very quick decision by them. And I signed up for the role because of the way it was written. It's such a complex and positive role. I have no problem with the overtly physical sexual presence. You don't have to be buttoned up to be intelligent. People do make deductions about people that look a certain way. So, to be intelligent is really annoying. Talent can be overlooked or overshadowed by looks. It can be frustrating. I've been very lucky that way. 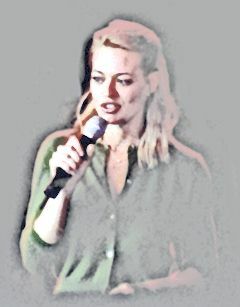 I think I've been getting a lot of recognition for the performances of Seven of Nine. I don't know. There will probably be one eventually, but not until we are off the TV-show. Not whilst we're still on the air on TV. Well, I knew about it. I didn't really watch it faithfully. Science Fiction was never the genre that I watched very much. I wasn't particularly aware of Star Trek but I am now. And I didn't know anything about Voyager. I had never really seen Voyager. I didn't know what I was getting into, I didn't know what to expect. Quite frankly I was pretty uneasy when I took this role. This could have been a very easy character. For them to take (this character) and make human by episode two. And have a bit of this character and have a bit of that character. And this could have been it. This would have been a really easy obvious choice with this character. And I didn't know Eve from Adam. They could have told me anything they wanted to. I was going into this one step forward and one step back... I wasn't really sure about it. But they've done a beautiful job. Writing and developing this character. And they've shown remarkable restraint. And I really applaud them for that. The Internet is a trip. It is a very strange phenomena. It's very surreal. Because that's the best word that sums it up. You have the whole website thing. The first one by the way, which is now the official Fan-club webpage, they started this thing six days after I got this role. I mean we were a month away from shooting and we were months away from being on the air. Six days after I got the role they had a web-page on me. Which was pretty strange. It is very flattering that somebody makes the effort to do these things but it's very surreal. You have websites, you have action figures that talk strange. My son was in "Toys 'R Us" walking down the aisle: "Look, there's Mum!" Honestly, that's true. He was in there looking for a spaceship that he wanted: "Oh, that's Mum. I'll have that one!" Which is now at the bottom of his toy-box, by the way. It was a very surreal experience but it was a lot of fun. Trekkies are like no other fans in the world: There is no more loyal and passionate group of people than Star Trek fans. I think it's fine. I have a lot of homosexual friends. It's not an issue that bothers me or whatever. I'm not homosexual but I have no problem with people who are. There were a few scenes in Voyager where everybody thought: "Oh look! Seven and the Captain! They're gonna get together!" And I got to be honest, there are a few scenes that make you go: "Oww, come on..."
There is one episode where Seven has her first date. And there is a scene with the Captain where this romance idea comes up. I think it gets to be a joke after a while. It's not anything the writers ever intended to do with the characters. Really. And there was a faked press-release on the Internet. That the producers had released this especially to introduce the first gay character on Star Trek. It's all a big myth. It's not true. However, it would not surprise me if this subject was not going to be touched on by this character (Seven). For an episode. It's not going to be an ongoing theme for Star Trek to come out and be gay. But Seven is the logical character for that to come up. Because she has no pre-conceived sexuality. And she is exploring every aspect of humanity. So, it wouldn't surprise me if we had an episode or two. But not with Captain Janeway. No! It's not going to be Seven and the Captain. I have a three year contract. The third year is season six. There will be seven seasons. At least seven. There may come more after that. I was born in Munich. My father was in the armed forces and we moved often to different cities. It was was hard for me as a child to do that. We lived in Germany, Kansas, Maryland, Hawaii, Georgia, Texas and Kentucky. So it was a lot of moving around. And then my Dad retired, so that my Brother and I could finish high-school in one place. And I had to transfer to go to another High-School, which was an accident. But it is probably a lot to go through as a kid. Just when you are starting to put down roots then you have to yank up and you have to move again. And most of the places that we moved were not necessarily military bases so a lot of the kids or their parents were not in the military. They lived there their whole lives. So that was hard. Now, as an adult, I can look back on it and realize how much I gained from it. I can appreciate the experiences that I got. You learn to be very adaptable. You learn to be very open to new people and situations. And it certainly lent itself to my life as an actor, this sort of a nomadic lifestyle. Garrett (Ensign Kim) and I were doing what we are calling walking talk. We were walking side by side and just rehearsing and the director said "Cut!". And I happened to keep walking and Garrett was turning around. To guard his back he kind of turned around and grabbed my (breast), yeah definitely. And turned bright red. He was stuttering: "I'm sorry, sorry. I thought it was your elbow!" So, of course, all of the crew, all of those big teamsters were watching it. They thought this was the funniest thing they've ever seen. But Garrett went embarrassed to his trailer. And a couple of the crew guys got some Post-It notes. You know the sticky paper thing? They wrote on one "ELBOW", with an arrow, on the other "NOT AN ELBOW". And they went with this to Garretts trailer. "Can we get another one out of you", they asked Garrett, and he came back to the set. The crew keeps reminding me about this little story. Here, complete in one volume, are the scripts for the original episodes of Star Trek: Voyager that brought Seven of Nine aboard Captain Janeway's ship. These powerful and thought-provoking narratives trace her tumultuous development from an anonymous Borg drone to a unique and exceptional individual, whose rediscovery of her own lost humanity has only just begun.